Added new feature: show control panel for ASIO device. Added new feature: transparent main window. Added option for scheduler: run task on the last day of month. Optimized recording thread of MME device to minimize the occurrence of sound dropouts. Improved Lame mp3 encoder compatibility with high definition recording. More flexible output file pattern and localized timestamp string. More reasonable DSP default setting. Easier creating/editing of scheduled tasks. Added support for WASAPI interface, event/pull styles and exclusive/shared modes are supported as well. Added support for WASAPI loopbak low-latency recording without introducing DAC quality loss. Added support for ASIO interface (official ASIO driver is required). Added support for WDM Kernel Streaming interface. Added support for DirectSound interface. Added new feature: redirect captured sound to a playback device while recording. Added new feature: make main window topmost. Added new feature: fully user-defined global hotkeys & app shortcuts. Added new DSP effect DC Offset Cancellation to eliminate unwanted DC hiss noise. A new neater, more intuitive, easy-to-navigate UI for convenient sound recording. Some audio data visualization enhancements. Fixed certain DSP effects cleaning-up bugs. Fixed a encoder option page bug. If you are a novice musician or audio enthusiast, you probably don’t have a fortune to spend on cutting-edge sound equipment, but you still want to have a decent platform to work and learn on. Fortunately, there is a software alternative to virtually any hardware solution these days and audio recording is not an exception. A modern computer can be used as a full-fledged sound recording studio, given that you have corresponding skills and software. So if skills are not a problem, all you need is Sonarca Audio Recorder! Sonarca Sound Recorder XiFi is a studio quality sound recorder designed for low-latency, high-fidelity, crystal clear sound recording. It supports all mainstream audio interfaces like MME, DirectSound, WASAPI, ASIO, WDM Kernel Streaming. With this high-definition streamlined MP3 recorder, you can easily record various sound input to dozens of audio formats effortlessly. 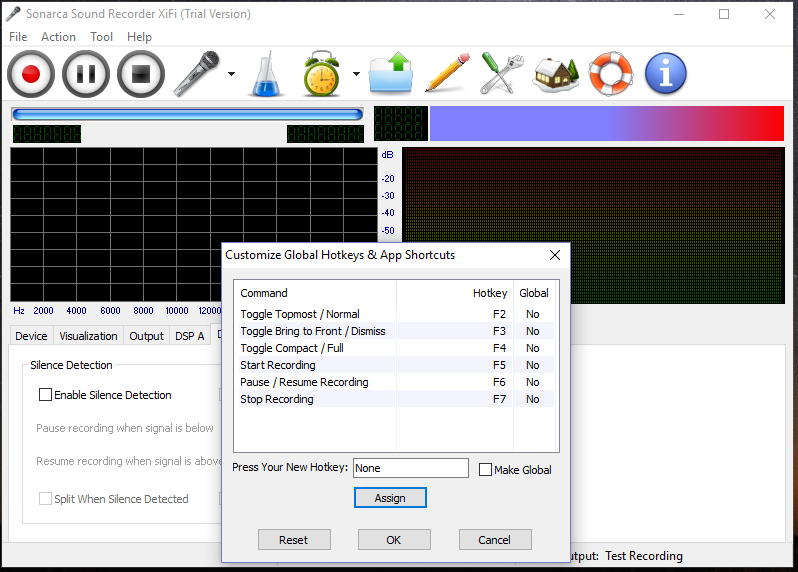 This sound recorder can record various sound input to dozens of audio formats and hundreds of codecs/subformats. 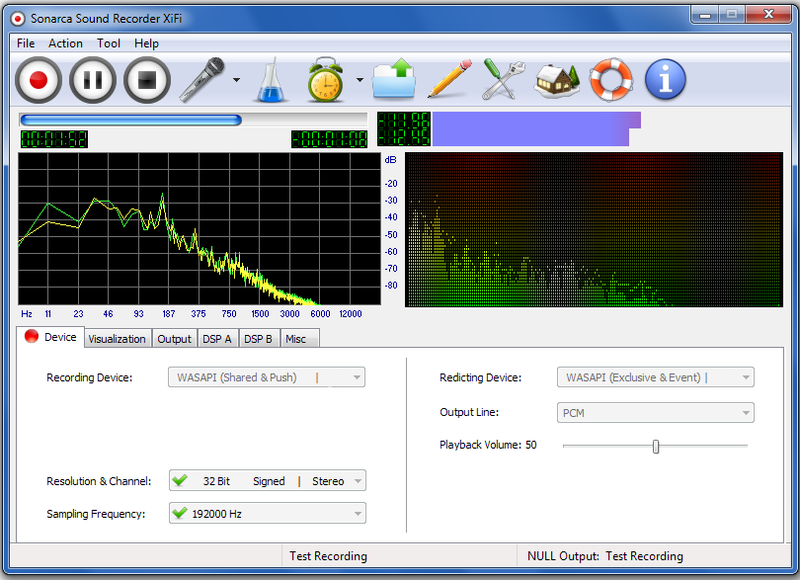 Supports WASAPI loopbak low-latency recording without introducing DAC quality loss. As a MP3 Recorder, it is capable of saving the recording as the popular MP3 format. Advanced "Silence Detection" feature enables automatically pausing/resuming sound recording according to sound volume. This sound recorder uses the latest Lame MP3 encoder which is generally believed as the the best MP3 encoder. Lossless sound recording, supports many modern lossless audio formats such as WAV/WMA Lossless/APE/FALC/AIFF/WavPack etc. This Sound Recording supports on-the-fly ripping, in other words, it does not generate temporary files during the ripping process. Handsfree mp3 recording when the scheduler enabled. Can make main window topmost. Various post-recording actions: Lock/Log Off/Stand By/Hibernate/Restart/Shutdown. Supports Multichannel, Professional, External USB Sound Cards. * This feature is for registered users only. If you were able to successfully enable a recording line, select the appropriate audio device as audio source prior to recording.